This was a fun one. 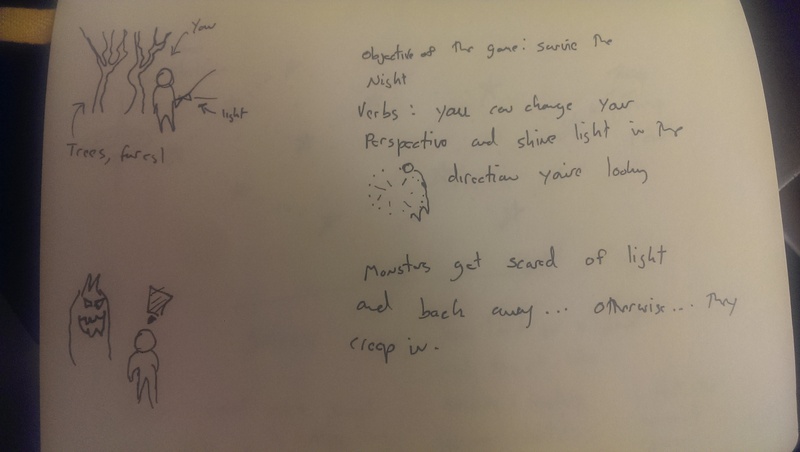 I’ve been thinking about games that only use gyroscopic controls, and Night Watch came out of that brainstorm. I tried to think of reasons why you wouldn’t be able to move and I thought of being scared stiff, or being dared to not move for a specific period of time. My mind then drifted to old shows like “Are you Afraid of the Dark?” and being dared to stay in a cemetery by yourself at midnight. 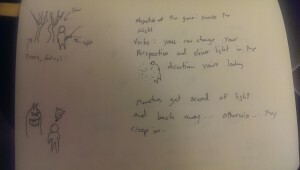 That idea then spawned the flashlight mechanic to fend off the ghosts. 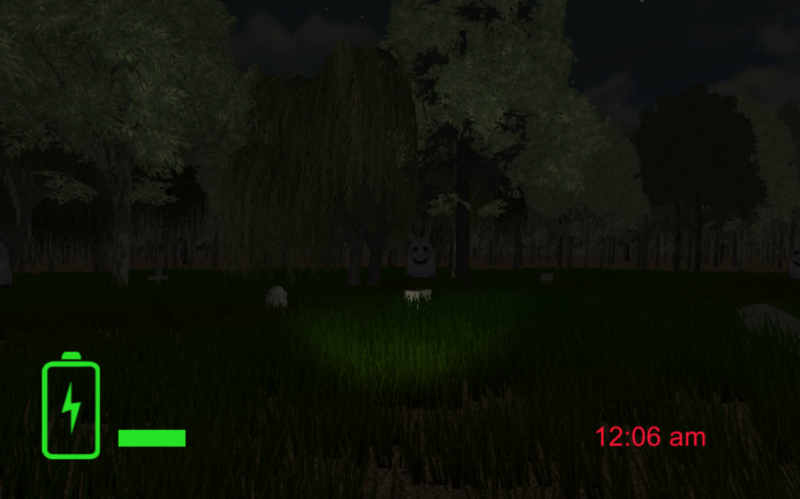 There were a lot of cool technical things I had to do in this project, like figure out how to make the ghosts vulnerable to the flashlight, all while keeping in mind that I’ll port this to google cardboard as soon as possible. Google’s provided code uses raycasting, but I thought it would be too expensive for each ghost to be making this call during the update cycle (are those calls still costly? I have no idea, but I bet they are). The solution I came up with was to create a hitbox that enabled/disabled when the flashlight toggles. I also tried to make sound a bigger part of the experience because I felt 3d sound would play a bigger role in vr. As a player, you can tell if the ghosts are approaching and from where because you hear them and orient yourself without light. I felt like this made the game too easy so I added some random sound makers to occasionally mislead players. Since the initial release, I’ve gone back and updated the game to focus on the gamefeel. I tried to think about actually being in the graveyard and what I could do to foster that feeling. One of the coolest additions (I’m totally biased on this) was adding a heartbeat that slowly grew louder as your flashlight’s battery decreased. I felt like this really helped to build the atmosphere because it kept with the metaphor of the flashlight providing safety. When you know you have a full battery you feel safe, but as the battery decreases and time goes on you start to freak out. 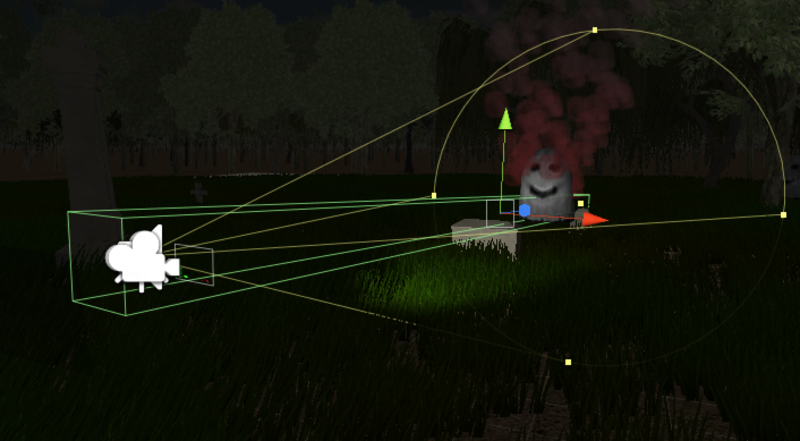 I also added an exploding animation for the ghosts, but I’m not quite happy with it. I feel like it makes too much of a commotion, and I should probably replace it with a more gradual fade out (A shader that turns a mesh to dust, or has them dissolve might work better here). The addition did seem to resonate with players, though, so maybe I’ll keep it. I’ve successfully ported the game to google cardboard, so keep an eye open for that release. I’ve uploaded the game to gamejolt, so if you want an achievement for making it to 1am, or want to support me with some ad revenue feel free to play it here.